The latest monthly QV House Price Index shows nationwide residential property values for July increased 6.4% over the past year which is the slowest annual rate since February 2015. Values rose by 1.6% over the past three months and the nationwide average value is now $641,280 which is 54.8% above the previous market peak of late 2007. When adjusted for inflation the nationwide annual increase drops slightly to 4.6% and values are now 29.2% above the 2007 peak. Residential property values across the Auckland Region increased 5.3% year on year which is the slowest annual rate of growth seen since May 2012. Quarterly value growth has plateaued for the second month in a row at 0.0% over the past three months. The average value for the Auckland Region is now $1,044,303 and values are now on average 91.1% higher than the previous peak of 2007. When adjusted for inflation values rose 3.4% over the past year and are 59.5% above the 2007 peak. Values are rising in some parts of Auckland and dropping in others. 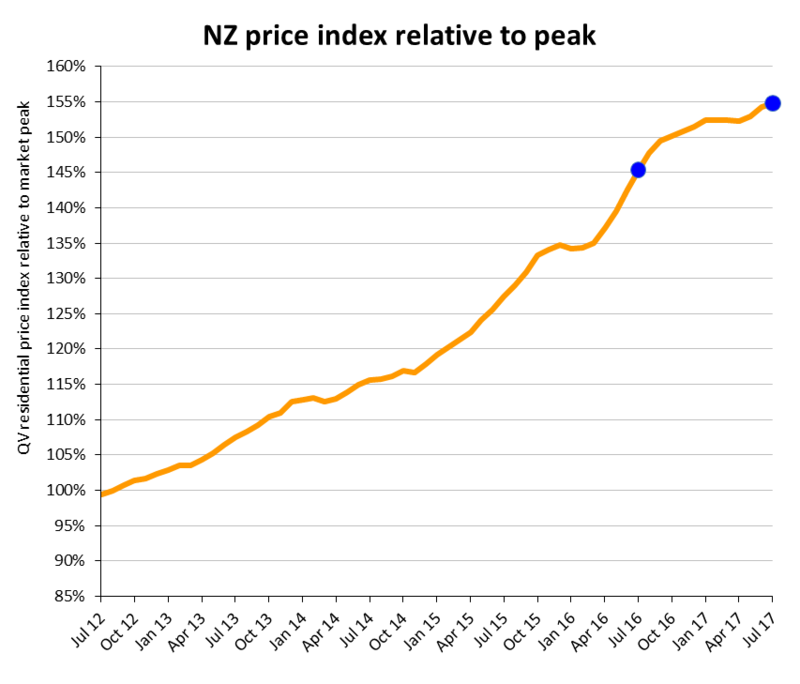 Waiheke Island saw the strongest rise with values up 4.1% over the past three months and values also rose slightly in Auckland City suburbs up 0.9%; and on the North Shore up 0.6%; while values decreased the most in Papakura where they dropped 2.6%; they were also down 1.6% in Franklin; 0.7% in Rodney, 0.9% in Waitakere and 0.5% in Manukau over the past quarter. Hamilton City home values rose 0.4% over the past three months and 5.4% year on year. Values are now 49.6% higher than the previous peak of 2007. The average value in the Hamilton is now $540,840. “The drop-off in the number of investment buyers has created opportunities for first home buyers, who were previously getting beaten when vying for properties. Tauranga home values continue to rise up by 12.3% year on year and 1.9% over the past three months. Values there are now 43.6% higher than the previous peak of 2007. The average value in the city is $691,350. Western Bay of Plenty increased by 14.4% year on year and 4.6% over the past three months. The average value in the district is now $617,754. The QV House Price Index shows values in the Wellington region continued to slow rising just 0.8% over the past three months. Values increased 15.8% year on year down from annual growth of 18.0% last month and they are now 33.2% higher than in the previous peak of 2007. The average value across the wider region has now ticked over $600,000 and is $607,011. Values dropped in Wellington-North by 0.5% and Wellington-West by 0.6% over the past quarter. New builds and off plan purchasers are selling well, as these are not impacted by the LVR restrictions introduced last year. Christchurch City values continue to plateau rising just 0.6% year on year and they decreased slightly by 0.2% over the past three months. Values in the city are now 30.5% higher than the previous peak of 2007. Dunedin residential property values continue to rise but at a slower rate than earlier in the year with quarterly growth slowing to 0.6% over the past three months. Values rose by 12.6% in the year since July 2016 and are now 30.6% above the previous peak of 2007. The average value in the city is now $373,857. Values rose the most over the past quarter in Dunedin Taieri where they increased by 2.1% while values in Dunedin-Peninsula Coastal areas dropped by 2.7% over the same period. Nelson residential property values rose 14.4% year on year but quarterly growth slowed to 0.8% over the past three months and values are now 38.8% higher than the previous peak of 2007. The average value in the city is now $531,659. Meanwhile values in the Tasman District have risen 16.7% year on year and 2.3% over the past three months and are 32.9% higher than in the previous peak of 2007. The average value in the district is now $533,816. Values continue to rise strongly across the Hawkes Bay region. Napier values rose 18.4% year on year and 5.7% over the past three months. The average value in the city is now $449,717 and values are now 32.2% above the previous peak of 2007. The Hastings market also continues to see strong value growth rising 20.0% year on year and 3.7% over the past three months and the market is now 36.0% higher than 2007. The average value there is now $423,750. Values Central Hawkes Bay have jumped 8.7% over the past three months and 22.7% in the year since July 2016. QV homevalue Hawkes Bay, Registered Valuer Michelle Drinkrow said, “The Hawkes Bay residential property market is still showing steady levels of activity and demand. Well-presented properties are continuing to sell well but in some instances buyers aren’t rushing to complete the sale like they were a few months ago. The latest round of LVR changes appears to have had a minor impact on some buyers but cash investors or those with high levels of equity remain active. We are also continuing to see out of town buyers moving to the area to live in search of more affordable housing. Residential vacant land in both Napier and Hastings remains in high demand with good sales levels being seen. We are noticing a limited number in listings available which could be in part due to the annual winter slow-down which traditionally occurs in the Hawkes Bay property market and also through buyers taking a wait and see approach until after the election. Most provincial areas of the North Island continue to see relatively strong value growth as buyers look outside of the main centres for more affordable property. Some of the strongest value growth has been seen in the Kaipara and Whangarei Districts North of Auckland; the Hauraki, South Waikato and Waitomo Districts near Hamilton and in Masterton; South Wairarapa and Carterton near Wellington. Values dropped in the Tararua, Ruapehu and South Taranaki Districts. In the South Island, the Queenstown market has begun rising again after a period of relatively flat growth up 4.9% over the past three months which may be driven by strong value growth at the top end of the market there. The average value there has now topped that of the Auckland Region at $1,092,748. Nearby Central Otago has also seen values rise 4.8% over the same period and values continue to rise in nearby MacKenzie and Clutha districts. Values in Westland are also rising up 4.5% over the past three months and 10.0% year on year while values continue to decrease in other parts of the Westcoast in the Buller and Grey Districts. Values also dropped in Kaikoura, Ashburton and Waimate.